It’s a myth that all living trusts avoid nursing home costs. Different kinds of trusts exist and some offer no protection against long-term care expenses at all. Even those that do are subject to one tricky rule. With some careful planning and a little luck, however, you might be able to use an irrevocable trust to avoid depleting your estate by paying for a nursing home. Revocable living trusts are those where you create the trust, transfer your property into its ownership and personally act as trustee. You have control of the trust and its contents. You can change your beneficiaries. You can take your property back if you decide you don’t want the trust to own it after all. Therefore, the law treats your trust’s assets as your property -- you never actually relinquish ownership. This means they’re available to you to pay for nursing home care and you must deplete them in order to qualify for Medicaid, the government insurance program that pays for long-term care. If you want to shield your estate from the costs of a nursing home, you must form and fund an irrevocable trust with your property. This involves naming someone else to act as trustee, and you can’t get change your mind and take your property back after you move it into the trust’s ownership. Your ownership of your property is severed so a nursing home can’t expect you to use these assets to pay for your care -- they’re not yours any longer. Moving your property into such a trust allows you to qualify for Medicaid. When you make the transfer of property, you effectively deplete your estate of disposable assets. This doesn’t have to leave you bereft -- the trust can provide you with income produced from the assets it holds. You would not necessarily have to move all your property into an irrevocable trust to qualify for Medicaid. Exactly how much of it you must divest yourself of depends on where you live -- asset and income limits are set by state, not federal, law. Property limits can range from $2,000 in some states to $10,000 or more, but not all your property counts toward this total. For example, your home typically doesn’t count so it may not be necessary to move this into an irrevocable trust. Check with a local attorney to be sure. Assets that contribute to the limit usually include things like cash in bank accounts, as well as stocks, bonds and other similar investments. If you have more than one automobile, the first one doesn’t count, but each additional vehicle does. Assets moved into an irrevocable trust do not count toward the total. The catch is that Medicaid has a five-year “look back” period that can put you in a bit of a bind if you’ve moved your countable assets into an irrevocable trust and can’t get them back. You cannot qualify for Medicaid for five years after you transfer your property into the trust. If you transfer assets then need long-term care four years and 11 months later, you’re within this look-back period -- and you may not be looking at just a month of ineligibility until you reach five years. 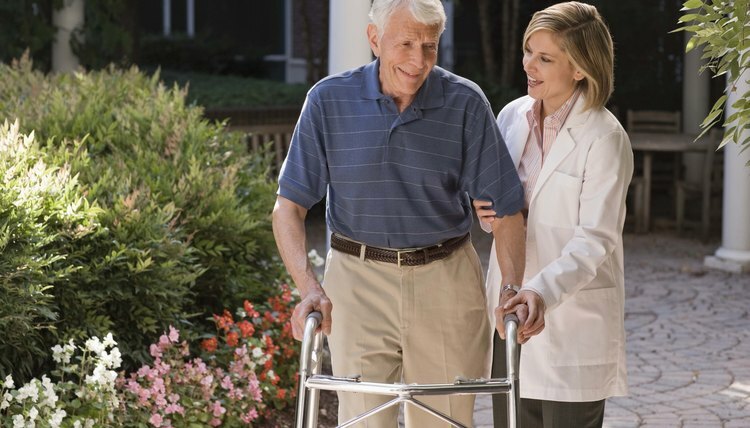 How long you’re ineligible depends on the value of the property you placed in trust and the average monthly cost of nursing home care in your state. If the average monthly cost is $5,000, the government divides the value of your transferred property by this number. If you moved $100,000 in assets, this comes out to 20, so you’d be ineligible for Medicaid for 20 months -- almost two years. Meanwhile, you can’t get your property back to pay for your care during this time. It's a good idea to consult with a lawyer to explore all your options before you take such a permanent step. Ohio Elder Law and Estate Planning: Does a Revocable Living Trust Protect My Assets from Nursing Homes? In the United States, there are various types of trusts you can create, all of which are either revocable or irrevocable. In comparison to revocable trusts, an irrevocable living trust is much more effective for eliminating your estate tax burden, in avoiding delays of asset distributions in probate courts and for Medicaid planning. However, an irrevocable trust only provides these benefits if you relinquish control over your assets.